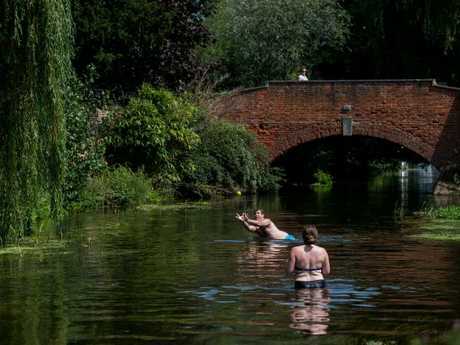 EUROPE is sweltering in intense heat with temperatures hitting near-record highs of 46 degrees Celsius in Portugal, while elsewhere the high temperatures exacerbated fires and melted the asphalt on highways. An influx of hot air and dust coming in from the Sahara Desert has prompted warning alerts in countries such as Portugal and Spain. 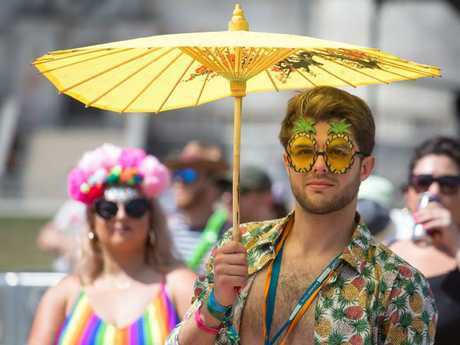 The hottest recorded temperature in continental Europe is 48C, in Greece in 1977, according to the World Meteorological Organisation. 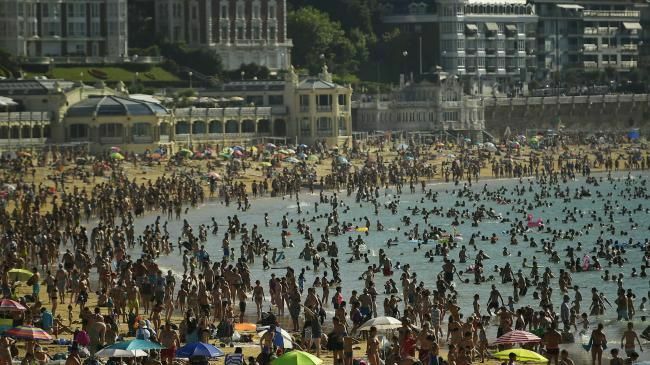 Portugal's highest recorded temperature was 47.4C, in 2003 and this weekend it's approaching 46C, more than half the country has been issued health warnings in anticipation for the extreme heat. 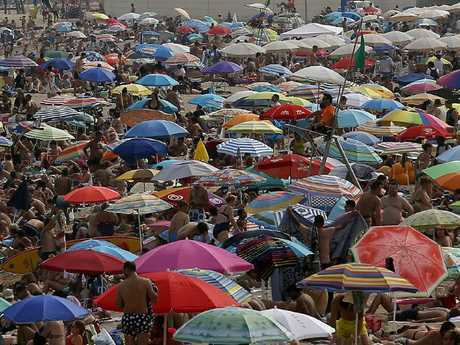 During the week, eight places in Portugal broke local temperature records. It was reported streets were deserted in the southern prominence of Alentejo, beaches in the capital, Lisbon, were packed and some farmers opted to work during the night. Almost 700 firefighters, 180 vehicles and 10 aircraft are battled a wildfire, which has already burned 2,470 acres in southern Portuguese town of Monchique, according to the Algarve Daily News. The Portugal News Online reported 40 people were evacuated as the blaze approached a village. 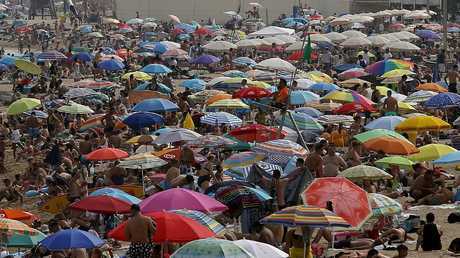 Three men have reportedly died in Spain due to heatstroke, two in the southeast region of Murcia, one in Barcelona. Areas in the south of Spain, like Seville, Guelva, Badajoz and Cordoba are expected to reach 45C in the coming days. Spanish military assisted emergency services in fighting a blaze in Nerva, in Spain's south, emergency services have said the wildfire is now stabilised. A wildfire near the capital, Madrid, has injured two people and damaged six homes. France has temporarily shut down four nuclear reactors in response to the heatwave. 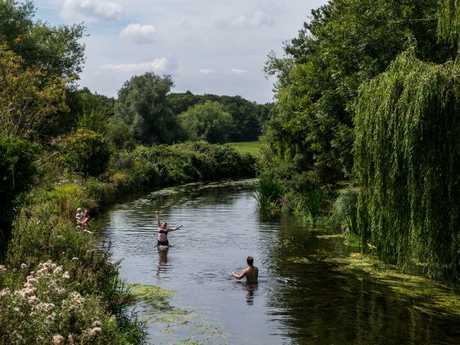 The decision was due to the fear of mass fish-die offs in local rivers as a result of water overheating. Nuclear power plants use water from rivers to cool the reactors, the water is then sent back to rivers. The nuclear power plants were near the Rhine and Rhone rivers, temperatures are expected to reach 37C in France's Rhone Valley. Although Austria isn't copping the worst of Europe's heatwave, police dogs patrolling a beach volleyball tournament will be fitted with special shoes. Temperatures have reached 34C in Austria but surfaces exposed to the sun may reach up to 50C, which would be excruciatingly hot for a pups paws. Police in the Swiss city of Zurich have called for dog owners to provide protection for their dogs, including providing them with shoes. The Zurich Police launched a Facebook campaign, appropriately called "Hot Dogs". Switzerland is experiencing heat up to 37C. The heat is expected to stick around for a few days, with hot air from Africa's Sahara Desert bringing not only the heat, but also dust particles.